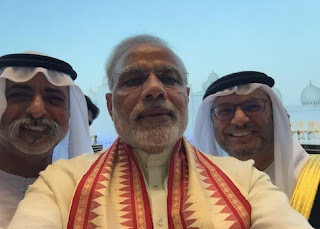 Prime Minister Narendra Modi posing with Arab sheikhs at the grand mosque, taking the selfie--this unbelievable scene was witnessed on Sunday. India's PM who never wore a skullcap and avoided going to a mosque or Islamic seminary,visited Sheikh Zayed Grand Mosque. This was Modi's 'Muslim moment', which came more than a year after he was elected as prime minister. Call it business or statesmanship, PM of world's largest democracy had to engage with the Muslim world--the followers of Islam account for 2 billion people on the globe. Though he has a strong right-wing constituency, he couldn't keep Muslim world at bay. For India, it is important to keep good relations with Arab countries, where millions of Indians live and work, sending huge foreign exchange. But the visit also underscores the need that Modi government needs to positively engage with Muslims in his own country. The fanatic and loud-mouthed right-wing needs to be checked and 'sab ka saath, sabka vikas' should be seen on ground. India can not afford to keep its 200 million (20 crore) Muslims neglected, and there is need for schemes to work for their progress and uplift. A few meetings with Ulema that have taken place aren't enough. This government needs to work for Muslims too, in earnest. A beginning has been made.albeit, on foreign land, and if he keeps the tempo, it would earn him goodwill as well as support of a huge section in the country.